A career as a pop musician may be the ultimate dream for many, but Marco Migliari has found his dream job on the other side of the studio, as a sound engineer at Real World Studios in Box, Wiltshire. Although not as high-profile as their pop-star counterparts, the engineers who record, mix, and produce music are just as essential to the final product that you hear. Tucked away in idyllic countryside surroundings near Bath, Real World Studios was established by rock musician Peter Gabriel about 20 years ago. Since then it has become one of the world's most famous high-tech recording studios, particularly known for its vibrant and eclectic world music. Whether it is working with established names such as Van Morrison, Robert Plant or Peter Gabriel, or new names to the Western world such as Nusrat Fateh Ali Khan, Yungchen Lhamo and Youssou N'Dour, the engineer's task is to make them sound good. Marco's career interests began in his hometown in Italy, where he worked at a local radio station, learning to use equipment such as their mixing console and reel-to-reel tape player. After studying electronic engineering in Italy, he moved to the UK to study music technology. Part of his programme of study included an internship at Real World Studios, where, after the day's work was done, he was allowed to "play" in any studio that was not in use. Before long he was part of the Real World team, and hasn't looked back since. 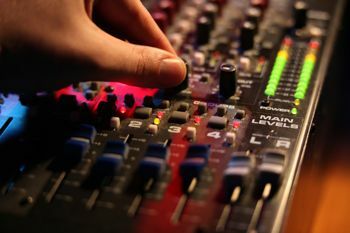 The job of a sound engineer involves a lot of technology and technical decisions, such as choosing sampling rates, sound encoding schemes and storage formats, and setting gains, EQ, dynamic ranges, and so on, in order to transform the electronic signals into beautiful music. But the real key to success lies not on the technological side, but the artistic: deciding how to position performers and microphones in order to capture their voices and instruments best. Experience doesn't provide all the answers, as Marco is often faced with exotic instruments that he’s never seen before. He describes how you have to use your ears to find the place where the instrument sounds best, and then "Put a mike where your ears are". Sounds simple, but we’re sure those ears have learnt a lot over the years.